What is another word for forces? 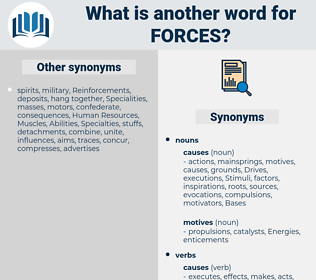 status-of-forces, contingents, Reinforcements, battalions, pressures, regiments, divisions, commandos, Energies, Navies, Policemen, navy, troops, enforces, corps. factors, francophones, considerations, Recommendations, Efforts, components, destroyers, Marines, elements, committees, Populations, conflicts, strenghts, Communities, Environments, institutions, Americans, actions, features, criticisms, Companies, Pensions, Veterans, drivers, departments, Areas, workers, engines, Agencies, machines, chinese, Countries, motors, Persons, employees, guides, nations, points, Has, authorities, transactions, 2004, Soldiers, combatants, strengths. protection, authorities, militaire, transactions, experience, experiences, warfare, soldier, Soldiers, general, servicemen, modernization, modernisation, violent, no., transaction, defending, combatants, machinery, CDF, rescue, director, gagetown, defensive, american, centre, arrangements, athletics, invisible, federal, Serbs, RSLAF, CFSA, central, CAO, promotion, experiments, FS, SOF, systems, U.S., hardware, CAF, organs, sofa, fuel, fuels, afp, extra, bureau, Bureaus, des, advocacy, change, changes, stake, strengths, jaish, h., VOL, iraq, militants, Fu, music, chi, organ, ugandan, have, TNI, KLA, PESH, kwan, high, game, Liang, KPA, tight, saudi, Thu, troops, tang, power, powers, safe. factors, influences, commanders, Resources, presence, presences, sources, militaries, militarys, considerations, headquarters, Recommendations, approximately, credentials, offices, deployments, peacekeepers, principles, CREWS, Efforts, squadrons, components, sectors, confrontations, alliance, detachments, Voices, compels, formations, Categories, accomplishments, brigades, contributions, contributors, Forms, Marines, endeavours, cadres, obligates, republic, Guards, Roles, elements, structures, constituents, committees, deploys, Populations, terms, processes, conflicts, Operators, Constituencies, organisations, counterparts, Phenomena, commissions, sections, currents, leaders, crowds, who, determinants, armaments, contractors, interests, Communities, authority, Environments, quarters, cooperation, troopers, stakeholders, obligations, rules, threats, solicitations, mechanisms, objects, ingredients, Mercenaries, machineries, demonstrations, remnants, advocates, Intermediaries, institutions, pieces, flocks, instances, Democrats, reasons, brokers, corpses, ministers, politicians, businessmen, guerrillas, Nationalities, situations, Realities, factions, terrorists, officials, Exercises, stresses, crushing, disasters, actions, obstacles, features, scholars, eritrea, Companies, chambers, costs, belonging, instruments, supporters, Veterans, Aspirations, Drives, drivers, barracks, devices, trends, objectives, rulers, Feet, departments, segments, acts, maneuvers, workers, engines, particles, incidents, warriors, developments, movement, Movements, Industries, Males, Tendencies, statutes, mandates, franks, Apparatuses, Cops, missiles, protagonists, challenges, lebanon, Agencies, ways, Entities, invaders, Branches, allies, Programs, aspects, rebels, shelling, keepers, demands, ranks, organisms, arguments, attacks, provides, players, CAMPS, shocks, insurgents, materials, deepening, machines, Families, relays, Capacities, parts, figures, causes, activists, Gunners, actors, Abilities, ravages, individuals, Countries, Ones, member, wings, motors, vessels, needs, positions, Persons, texts, people, Drills, borders, events, compounds, files, columns, quotas, battles, rows, equipments, partners, gangs, employees, utmost, guides, british, points, Policies, Ships, skills, Helmets, modules, baghdad, -rrb-, strands, examples, attempts, militant, aids, Boots, circles, move, items, inputs, bullets, teeth, launches, hands, agents, Allys, abuses, requests, iraqi, games, kabul, kits, posts, views, Bases, taiwan, tanks, sides, shifts, clashes, wishes, funds, Wills, states, Facilities, men, gunmen, authorities, transactions, Soldiers, combatants, arrangements, invisible, systems, organs, Bureaus, changes, iraq, militants, powers. formed, cornered, Were, welcomed, beat, defeated, Invaded, seized, Took, won, played. 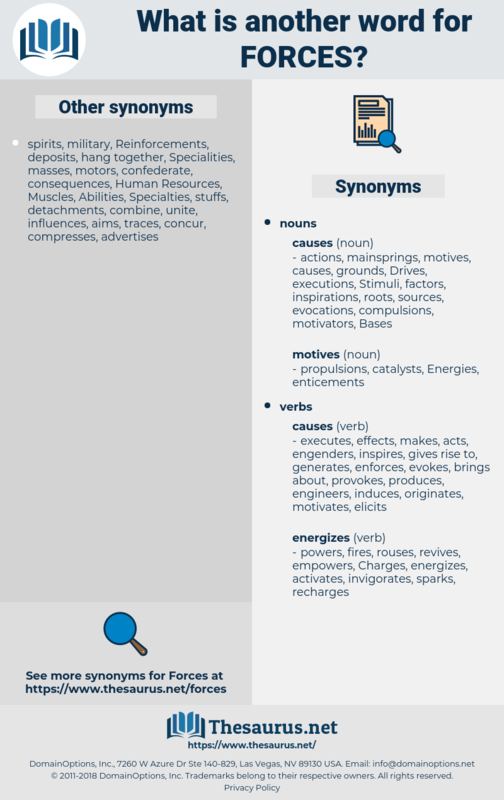 beats, necessitates, encourages, imposes, occurs, commits, prescribes, condemns, places, urges, directs, dictates, pushes, appears, impels, welcomes, driver, requires, involves, compels, afraid, brings, 's, obligates, remains, entails, implies, Carrying, Gives, binds, applies, leads, draws, lays, grows, calls, lies, Drives, public, puts, mandates, demands, compel, provides, causes, Has, Does, Soldiers, makes, combatants, des, strengths. Forcing, defences, armies, coalition, militias, tasks, violence. It depends only on you to add our forces to your own. And 'on the other side of Death, ' as she had said, they would meet - and to that 'other side' they were sailing together with all the speed Heaven's own forces could give to their journey.